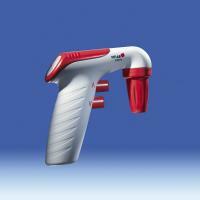 For all pipettes from 0.1 to 100 ml With the new pipet controller VITLAB pipeo®, pipet handling is simple and comfortable. The ergonomic handle, very light weight - only about 190 grams - and excellent balance all contribute to operating ease. Freely and precisely adjust the speed of the liquid discharge with one hand using the two easily accessible buttons. A 50 ml pipet can be filled, quietly and with minimum vibration, in less than ten seconds. The VITLAB pipeo® can be set to release liquid either in gravity delivery, or in blow out mode using the battery-operated motor. VITLAB pipeo®, battery charger, battery, battery compartment cover, two spare membrane filters 0.2 µm, instruction manual.